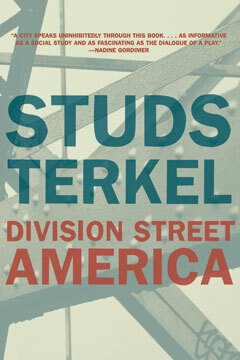 Division Street, Studs Terkel’s first book of oral history, established his reputation as America’s foremost oral historian and as “one of those rare thinkers who is actually willing to go out and talk to the incredible people of this country” (in the words of Tom Wolfe). Viewing the inhabitants of a single city, Chicago, as a microcosm of the nation at large, Division Street chronicles the thoughts and feelings of some seventy people from widely varying backgrounds in terms of class, race, and personal history. From a mother and son who migrated from Appalachia to a Native American boilerman, from a streetwise ex–gang leader to a liberal police officer, from the poorest African Americans to the richest socialites, these unique and often intimate first-person accounts form a multifaceted collage that defies any simple stereotype of America. As Terkel himself put it: “I was on the prowl for a cross–section of urban thought, using no one method or technique. . . I guess I was seeking some balance in the wildlife of the city as Rachel Carson sought it in nature. Revealing aspects of people’s lives that are normally invisible to most of us, Division Street is a fascinating survey of a city, and a society, at a pivotal moment of the twentieth century.